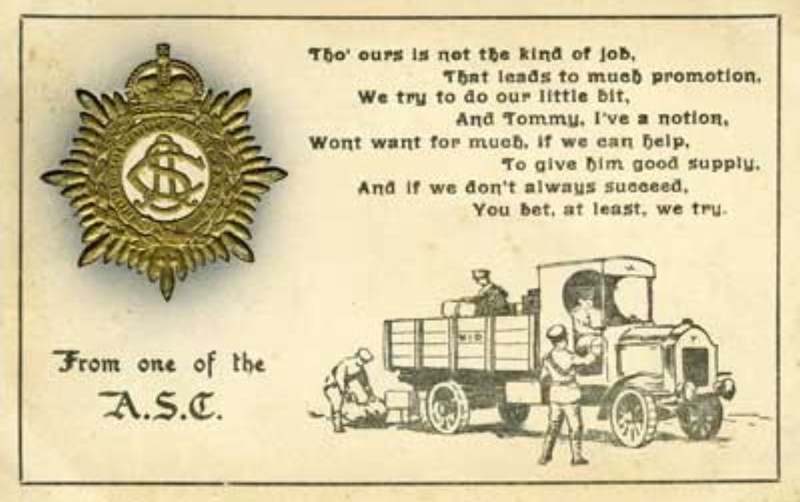 The Army Service Corps was an essential part of maintaining the army and keeping its soldiers fed, watered and equipped and able to fulfil their roles on the front line and the home front: providing food, equipment and ammunition, providing horses and vehicles, and keeping supplies moving by horse-drawn and motor transport, rail and water, to wherever they were required. The Corps was organised into companies – horse transport, mechanical transport, remounts, labour, and supply – served by base depots. Some were under the orders of divisions with the rest under the orders of corps, army or General Headquarters. Not all the soldiers of the Army Service Corps were with the Corps’ companies but were attached to other army units, eg as drivers. At it height, the Corps comprised 10,547 officers and 315,334 men. Supplying an army of millions – building up to 2 million in France alone – was an enormous task, and the majority of goods and equipment required overseas was supplied from Britain. The complex supply chain had to move these vast quantities of supplies from Britain to a base port, from there to a divisional railhead or advanced supply depot, onwards to a divisional refilling point, then to the forward dumps from where a unit itself would move supplies to the front line.